Leviathan in Final Fantasy VII. Leviathan (リヴァイアサン, Leviathan) is a summon from the Final Fantasy series. A giant sea serpent, he first appears as a monster that swallowed the party in Final Fantasy II, and went on to become one of the most prominent summons alongside Bahamut. Given titles such as "The Sea King", or "Lord of All Waters". In the later titles Leviathan's appearances in the series started to become lesser as Bahamut gained more status and popularity. Leviathan's trademark attack is Tsunami, which calls on a massive wave of water to damage all enemies. 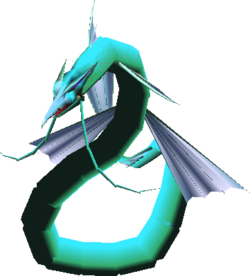 Leviathan appears as one of the summons on Midgar. When he appears, he floods the stage and causes it to surf across a body of water. Leaviathan as he appears in Midgar. Leviathan on Midgar with Greninja in Ultimate. This page was last edited on November 23, 2018, at 22:19.